There are many different known species of spiders worldwide, tens of thousands in fact, but all spiders are specifically characterized by their eight legs, dual-regioned body, and lack of wings and antennae. Most spiders enjoy darkness and moisture and tend to build their webbed homes in places like crawl spaces, attics, or basements. They only eat other insects that they are able to subdue through trapping in their web and then use additional webbings to make them immobile and easy to consume. 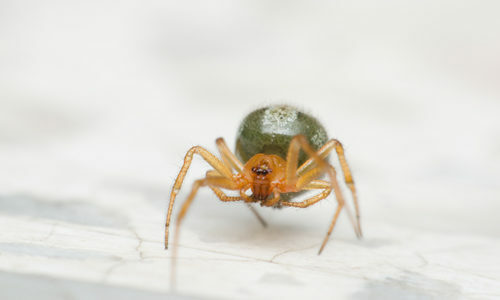 In fact, spider mouths are different than those of other insects. They don’t have a hinged jaw or chewing mouthpart so they use enzymes in their saliva to break down trapped prey before they eat it. The silk that spiders create is elastic, adhesive, and surprisingly strong which allows them to use it to build just about everything they need to both trap prey and build their homes. We’ll be upfront with you: all spiders bite. There are few in the South that are venomous, however, so if you have a spider infestation in your home or business you’re likely going to be significantly inconvenienced but not necessarily physical harmed. While most spiders aren’t going to be a direct threat to you or your family’s well being, we still recommend calling a pest control professional if you notice a lot of them milling about your home so you can get them removed safely. If you have spiders, they’ve likely entered your home in one of two distinct ways: through waltzing in through poorly screened windows or doors or by sneaking in through cracks and gaps in or around your home entry points. If you have spiders in your home, they were drawn in by the presence of a viable food source, which in turns means that you could already have an existing pest infestation in your home that compelled them to enter. If a spider is in your home, it’s because it’s hungry, not because it wants to cause you any trouble, so don’t worry too much if you see them around. That said, there are a number of ways to motivate them away from your home instead of into it. These ways include maintaining a regular cleaning schedule to avoid any dust build-up that they can build homes in. Seal any foundational cracks, gaps in or near windows and other entry points, and other potential ways in. Finally, we recommend calling a professional pest control company if you have a lot of spiders appearing in your home because, like we previously mentioned, their presence likely means that you have a regular food source inside your home that they’re interested in. How can Gregory Pest remove spiders from my home or business? An expert exterminator from Gregory Pest Solutions will be your full-service pest solutions provider specializing in the effective, humane removal and prevention of spiders and their webs from your home or business. When you hire us to evaluate how extensive your home’s pest problem is, one of our pros will be sent to assess the spider situation and then formulate an environmentally friendly plan for removal and prevention. Once we implement our plan, our experts will clean the area and seal any openings that are prime for future entry so that you and your family can enjoy a lasting pest-free environment.